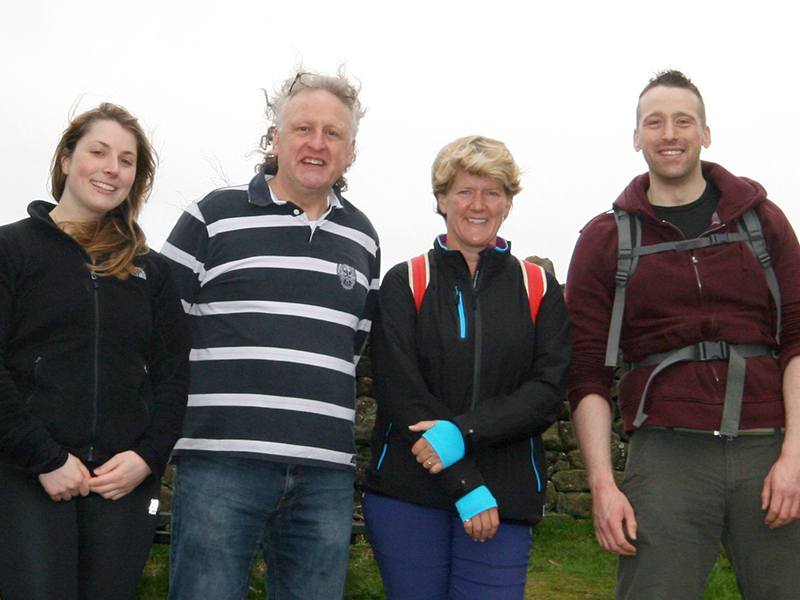 Clare Balding Walks the Nidderdale Way! Throughout May and June 2017, the Nidderdale Way is featured on BBC Radio 4 Ramblings with Broadcaster Clare Balding! The Nidderdale Way is a beautiful circular walk within the Nidderdale area of outstanding natural beauty. 53 miles long, the route starts and finishes in Pateley Bridge and follows the river Nidd and leads up the valley above Scar House Reservoir before heading back down and through the village of Ripley. Attractions along the way include the wind-weathered gritstone ‘sculptures’ of Brimham Rocks; How Stean Gorge, a spectacular limestone ravine; Yorke’s Folly, built to resemble a window arch from a ruined abbey, and Ripley Castle with its deer park and gardens laid out by Capability Brown. The route visits several attractive villages such as Middlesmoor clinging tenaciously to the hillside (with a wonderful view from the Church), Ramsgill, with a spacious green surrounded by stone cottages with flower-filled gardens and an imposing ivy-clad former hunting lodge; and Ripley, a beautiful 19th century estate village rebuilt to resemble a French village. It has a fine medieval market cross with stocks alongside and the churchyard contains a fascinating pre-Reformation ‘weeping cross’: sockets at the bottom cater for the knees of four ‘penitent’ souls. Although the Nidderdale Way is a low-level route, it does climb the valley sides to follow gritstone edges and moorland fringes for rewarding views over the dale. The Start and Finish point of the Nidderdale Way is a white cast sign which is attached to a green directional fingerpost at the bottom of Pateley Bridge High Street opposite the Spar Convenience Store. You can Sat Nav to postcode HG3 5AW. On completion of the walk, you can collect a FREE badge (I have completed the Nidderdale Way 53 miles) from the Sypeland Outdoors, the Oldest Sweet Shop or RS Discounts – all based on the High Street in Pateley Bridge. 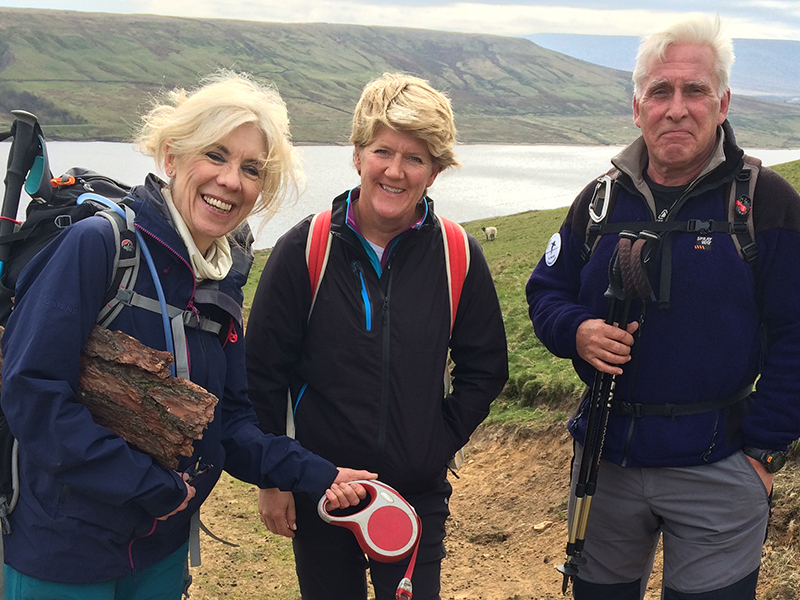 In this series Clare Balding will walk the Nidderdale Way, a spectacular fifty- three mile route in North Yorkshire, encircling the valley of the River Nidd. On this first section from Pateley Bridge to Scar House Reservoir, she’s joined by local walking expert, Stephen Spellman and Michelin star chef, Frances Atkins. Frances is one of only six female chefs in the UK to have a Michelin Star, her restaurant is en route at Ramsgill . She explains how important walking is for her as a source of inspiration and relaxation from the stresses of the kitchen. Stephen advises Clare on the right equipment to have when tackling consecutive days of walking. They’re also joined by Frances’s black Labrador, Polly. While something of a law unto herself, Polly clearly loves this landscape of moorland, rolling green fields, dry stone walls and remote farm houses as much as her three companions. Producer : Lucy Lunt. 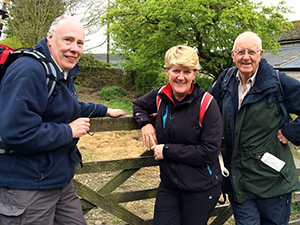 Clare Balding embarks on the second leg of the Nidderdale Way , a 53 mile circular walk that begins and ends in the North Yorkshire town of Pateley Bridge. Today she’s joined by the Rev Darryl Hall and Methodist minister, Mike Poole, who work and walk together regularly , known locally as the Ant and Dec of the church. Mike’s wife Julia also comes along with the map to ensure they stay on track. This section of the walk takes them through the small hill village of Middlesmoor. Its church, St Chads, boasts of having one of the best views in Britain and Clare believes the community can also brag about their very excellent public conveniences. For this series Clare is using OS Explorer 298, starting reference for this walk 066 766, and the Harvey map of The Nidderdale Way. Producer: Lucy Lunt. 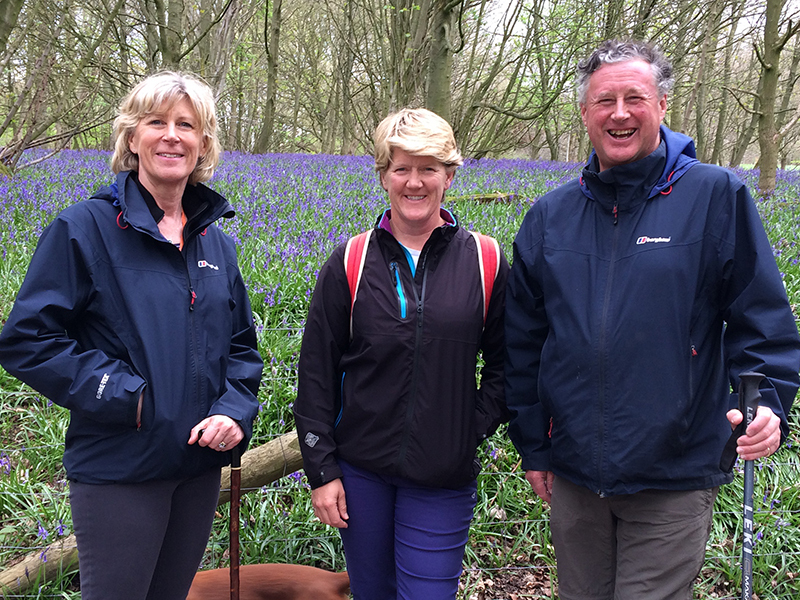 Clare Balding is walking the whole of The Nidderdale Way, a circular fifty three mile walking route in North Yorkshire. In this edition she walks from Heathfield to Bewerley in the company of Robin Hermes and Simon Dunn, two self-styled, grumpy old men. They have been walking together, along with their friend Richard, every month for over thirty-five years and this is the first time they’ve actually invited anyone to join them. The Ramblings team don’t make the most auspicious start by being several minutes late, a sin Robin holds against them right until the end when the joys of the afternoon allow him to forgive and forget! This section of the walk takes in the site of the disused lead mines at Ashfold Side Beck. Robin and Simon discuss their walking history with Clare, their favourite and least favourite routes and how they score the perfect walk. Producer Lucy Lunt. 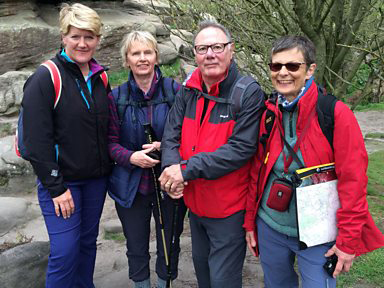 Clare Balding is walking The Nidderdale Way in North Yorkshire for this series and here she completes the fourth leg of the route from Bewerley to Dacre Banks. She’s accompanied by three members of the Tordoff family. Keith, came to the town of Pateley Bridge, that lies in the centre of the dale, twenty five years ago with his wife, Gloria. He gave up the stress of being a police officer in Leeds and took to running the local sweetshop, the oldest in the country. He is now a spokesman for the town and the area and does all he can to promote it, concerned as he is, that small rural towns like this, can die without the whole community pulling together. His son Alex is a local fireman and his partner Kirsty also works in the family business. 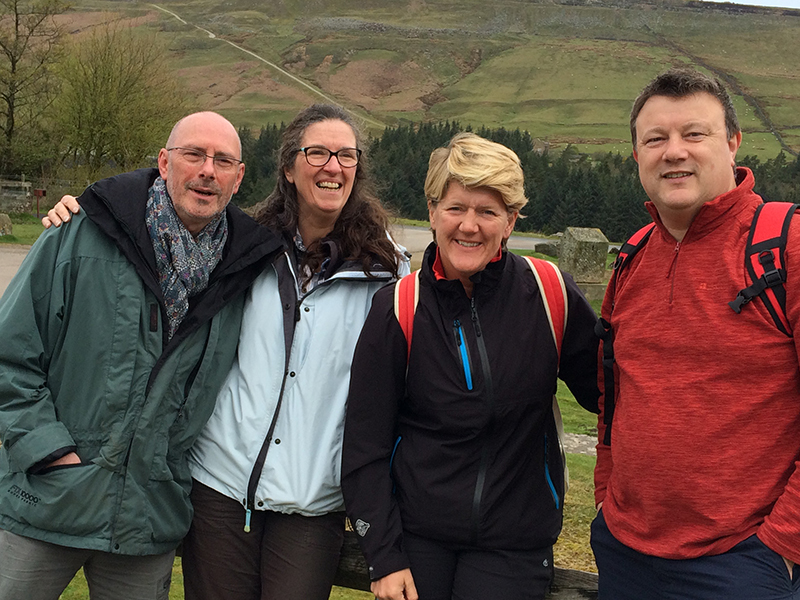 Kirsty and Alex explain to Clare that their love of walking has taken them traveling all over the world, while Keith explains his love of Pateley Bridge means he no longer wishes to go anywhere else. Their walk starts at Bewerley Grange Chapel where Keith’s parents are buried and ends in the village of Dacre Banks, right on the banks of the river Nidd. Producer Lucy Lunt. Clare Balding nears the end of her walk along The Nidderdale Way, a fifty three mile route, that starts and finishes in Pateley Bridge. Today she walks the most easterly stretch passing through the Ripley Estate, home to the Ingilby family for over seven hundred years. Sir Thomas Ingilby a keen long distance walker, and his wife Lady Emma, explain how they welcome ramblers through the estate and have constructed new paths to ease their way. Producer Lucy Lunt. I’m listening to the BBC4 podcast with Clare Balding on the Nidderdale Way while I am working in Dallas, TX. My area is not walking friendly most of the year (it’s very hot) so I appreciate all the great places Clare walks in the UK. She’s inspiring! My British husband and I visit the UK yearly and we always love hiking & walking while we are there including the parks and hidden places in London. Nature nurture is my motto.